My faith in the Need for Speed franchise going back to being fun has been drained. My last enjoyment was Need for Speed: Hot Pursuit in 2010 for a guilty pleasure, and Need for Speed: The Run in 2011. In my Trailer Impression for Need for Speed: Payback, I noted how the heist scene played out like something in the recent Fast & Furious movies. I figured this game would be popcorn fun. While the story retains this, the process was one of the most frustrating things I’ve experienced in a while. You have to level up your vehicle through a series of random perk cards that you can trade out for stronger perks in the tune shop, which resets every ten minutes (real time). If you want to customize your vehicle, instead of buying parts with in-game money, you have to unlock those parts by performing tasks. 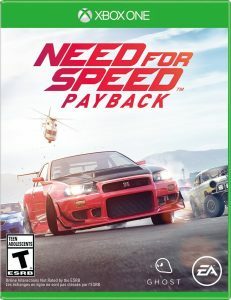 While the story has you driving in four different styles: race, off-road, drift, and heist, the game, to me, came off as “Forza Horizon-lite.” Little did I know that the perk system with Payback is nothing compared to other games using a similar method that is becoming common.